BBC NEWS | UK | Magazine | Did Diana's death change us? Did Diana's death change us? The effect of the death of Diana, Princess of Wales, on the British public was as perplexing as it was profound. But was it a blip or did it change Britain for ever? On the morning Diana's death was reported, few could have guessed the extraordinary momentum that the mourning for her would generate. By the time of her funeral it had reached fever pitch, with thousands lining the funeral route. A sea of flowers was laid in front of Kensington Palace, strangers embraced, snaking queues formed in front of books of condolence, businesses closed as a mark of respect. In one small section of society, the death spawned further tragedy. 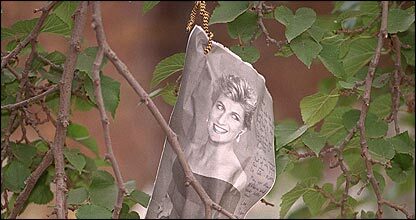 Suicide rates rose, particularly among women of a similar age to Diana, more people self-harmed in the week after her death and some declared themselves to have mourned more for a princess they had never met than their own parents. Her passing roughly coincided with a seemingly broader shift in British sentiments, marked by the end of 18 years of Conservative government a few months earlier. In his recent History of Modern Britain, writer and broadcaster Andrew Marr noted the "perceived shift towards a more compassionate, more informal and more image-conscious Britain". Had this princess unlocked something in the psyche of the nation, typically painted as private, stoic and emotionally detached? Or was this just a twitch of our otherwise rigid upper lip? After her death on 31 August 1997, the newspapers were telling us the nation's streets were stained with our tears (Evening Standard) and that Diana had brought an intensely personal language of pain and love into the "buttoned-up discourse of civic life" (Independent). Shock and sorrow. But did Diana's death have a lasting impact? Even the death of an idolised war leader like Winston Churchill could not compare to the type of grief that accompanied Diana's death, says psychologist Dr Christina McVey. "A huge number of people took to the streets in 1965 for Winston Churchill's funeral but that was to pay their respects in silence, so there's a qualitative difference. "People related to Princess Diana as a 'feeling' person. The public perception was she was prepared to publicly hug her children, be tearful and vulnerable." This, Dr McVey says, legitimised people's own emotions and behaviour. Dr Simon Critchley, one of many academics who studied Diana after her death, believes she became "some sort of universal lightning rod for people's sense of hurt, wrong and pain". On half a dozen occasions since 1997 the country has appeared united in grief. The reactions to the Soham murders, to that of Sarah Payne, and to the abduction of Madeleine McCann have borne similarities to the loss of Diana. And yet there had been public outpourings of grief before Diana, such as the murder of James Bulger. While it is difficult to prove changes in the nation's mental state, there was concrete evidence that some of society's most vulnerable members were affected by the death of Diana. Research by the Centre for Suicide Research in Oxford showed self-harm had risen by 44% (65% in women) in the week after the princess's death. One woman tried to take an overdose. Her case notes explained she shared her birthday with the day of Diana's death. Another patient's case notes said the media coverage of Diana's funeral had amplified the grief for her brother who had also died in a road accident. 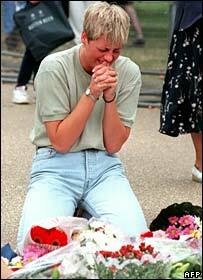 The same researchers showed suicides in England and Wales increased by 17% in the month following Diana's funeral. Among women aged 25 to 44, this was as high as 45%. This could be explained by an "identification" factor - the kind of people who most identified with the princess were most affected by her death, consultant psychiatrist Raj Persaud suggests. He says it was possible that women close to her in age who identified with her relationship and psychological difficulties became more pessimistic about their own ability to conquer similar problems. However he points out that any widely reported death or suicide of a public figure can cause the suicide rate to rise. But there is no strong evidence to suggest Diana influenced the way we handle our emotions in the longer term, Dr Persaud suggests. "There is some recent research that throughout the Western world people are becoming more extrovert - a trend going on since the 1960s. "Extrovert people are more open about their emotions. We are becoming more open, but Princess Diana would not have been the cause of that," he explains. Documentary maker Colin Luke questions the premise that we were ever united in grief. The public response was in fact much more complex, he says - a conclusion he reached after sending eight film makers to mingle with the crowds of mourners before Diana's funeral. "Documentaries tell different truths. There was a great mix of emotions. There were people mourning her death, people drunk on Friday, lots of tourists thinking here's a big event and we want to watch it. "There were those who identified with Diana, gay people, people with problems in their lives and a considerable number were mourning her because they were mourning someone in their own lives. "They had lost someone close to them but found it difficult to mourn. With it being a group activity, that made it easier." The film, the Princess's People, which was eventually shown on the first anniversary of her death, painted a very different picture from the one in our memories and our newspapers, and caused a huge furore. Reflecting on the film now, Colin Luke says: "While the film was shocking in its day, it became the prevailing attitude. Those newspapers who tried to tell us we were all mourning, were the ones who got it wrong." Any pollster or psychologist would find it hard to gauge in concrete terms any change in British emotion. We may have more daytime television shows full of emotional outbursts, be prone to wearing charity wristbands and spill out our feelings in blogs and social networks, but there is much that remains the same. Diana was a wonderful woman and I'm sure deserved the public reaction to her death. But, let's face it people, it's been 10 years! Can we please let her rest in peace and value her memory less publicly. The response of many people on that day 10 years ago should not be ridiculed. Diana had become very much part of people's lives and as such her death was felt just as keenly as if it had been a close family member. The public had watched the marriage and celebrated, witnessed the birth of her two sons and congratulated, stood in awe as she dazzled every day folks with her humour, cried with sympathy at her ability to comfort the terminally ill. This is what made her special and this is what people remember her for. Ultimately we all felt saddened that her two beloved boys had lost both their mother and their friend. The continuation of the many lines of enquiry and accusations surrounding her death did little in the way of allowing her sons to come to terms with this tragedy in a personal way. She will never be forgotten and every time Williams smiles or Harry laughs in front of the camera, she is there. Over the top does not begin to cover it. I think I knew of only one person other than myself who did not think this was a reason for mass hysteria and at least a week off work due to bereavement. Did not know her, did not like what I saw of her. God, can we please let this go, getting very fed up of hearing about her. Many of us really DIDN'T get caught up in the lunacy of those days - we recognised it for the small scale private tragedy it was, but felt the death of one private individual, wealthy and privileged beyond the dreams of most, at the hands of her boyfriend's drunk chauffeur was nothing more than a passing ripple in the oceans of our own busy lives. Ye gods! At the time, I felt like the only sane person in Bedlam. I was surprised and saddened at her untimely demise, but I watched the increasing Di-death-mania with incredulity. I still don't understand how so many people got so swept up by the death of someone they had never met. People are strange. Good god, are we still wailing over this? Ask the same idiots who cry over this how many dead British soldiers have been shipped back from Iraq. I had the misfortune to be in London at the time. The place was full of serial weepers. Dreadful. Was I the only one who was profoundly unmoved by the death of Diana? I did feel sorry for her family, especially her boys, but on a personal level I never felt touched by her life, so was not touched by her death. I couldn't have given two hoots about Diana. 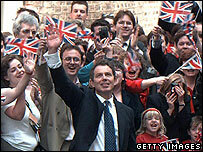 The public outpouring and excessive press was embarrassing and for a couple of months I felt ashamed to be British. I felt the effect in that people called me callous for not sharing in the grief and I was close to being shunned for not wanting to get involved in the mourning of a woman I never knew personally and didn't have any interest in publicly. I was sorry for the way the poor little cat died hounded by the press and a degree of sorrow was understandable then. However, it is 10 years since she died and the time has surely come to bury the dead and move on. She was an iconic figurehead. She would have, if circumstances had been different brought the monarchy into a new era. Even though I have the greatest of respect for the royals, they do need to come out to show their humanitarian side. What a load of rubbish. Hardly anyone I know was affected by this. I remember heading back to work on the Monday and the only person in the office upset was a young PA. She was horrified that I said I had had a good weekend with friends. I can't recall anyone mentioning it much since and certainly not being upset. It's all media hype and a few stupid people focusing on a figure they never met. Just give the whole thing a rest will you and do some proper journalism.